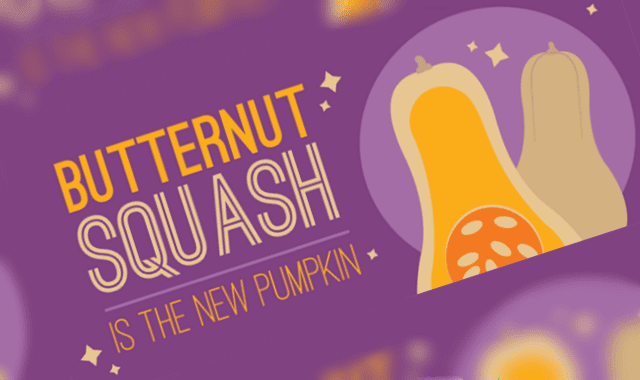 Butternut Squash Is the New Pumpkin #Infographic ~ Visualistan '+g+"
Like pumpkins, butternut squash grows on vines and boasts a rich, orange inside. Both are types of squashes; butternut squash is actually known as “butternut pumpkin” in Australia and New Zealand. However, butternut squash is easier to work with than pumpkin, and since it can be used in sweet and savory meals, butternut squash is the perfect ingredient for fall grub. It comes down to the right mindset and approach. Keep reading to learn all about butternut squash; before you know it, you’ll be a pro at autumn cooking.